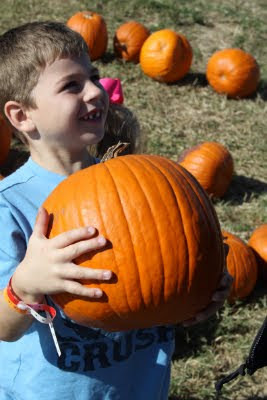 We had a wonderful weekend complete with a visit from Curt's parents, field day at Jackson's school, a legit cold front, lots of good food, a trip to Dewberry farm, fall baking day with my girlfriends, church and a block party. This was our fourth year to visit Dewberry Farm. 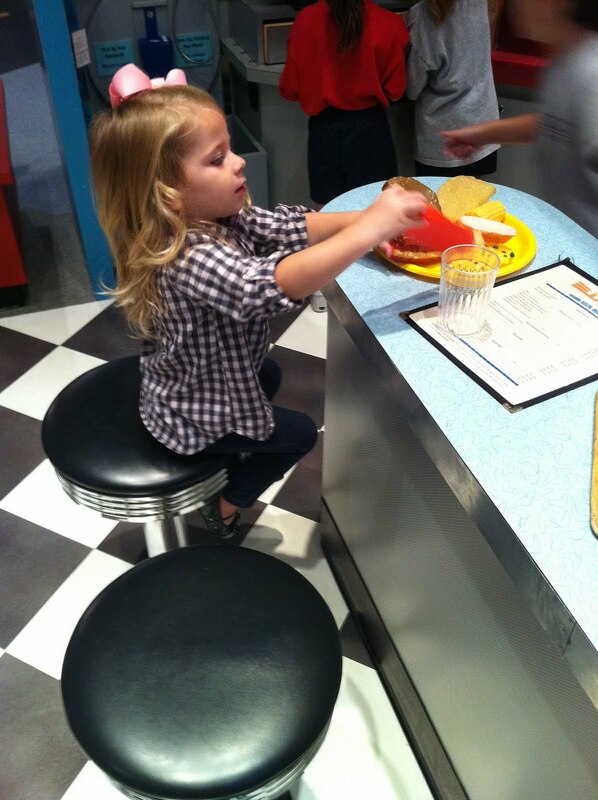 The first time we went, Jackson was Annabeth's age. It has gotten bigger every year and I think this time the extra attractions helped spread the crowd out nicely. 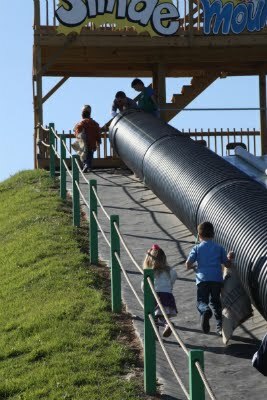 This giant slide was one of the new things. The kids were so cute climbing the hill together. This is Jackson shooting corn cobs at targets. This beast of gun shot mini water bottles at targets. He was very successful with some help from his dad. 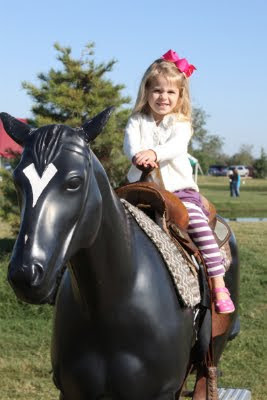 Annabeth wanted to sit on this horse, which made me happy. We went out to the pumpkin patch on the farmer's wagon. Apparently they had tried to plant pumpkins but with the drought, they just didn't grow. So the pumpkins they had were imported from out of state. Let's just say the heat had not been kind to a lot of them. It was like a pumpkin graveyard. Here's my future horsewoman on a noble steed. I thought she had nice form. She had no fear whatsoever. Jackson's favorite attraction has always been these bouncy things. Annabeth loved them too. Here's the Mister on the zip lines. This looks so fun to me. The last thing we did was pan for arrowheads. Look at this face! So funny! On the way home, my people dropped me off at fall baking day with my girlfriends, AKA The Blogging Barbies. These baking days are out of control awesome, thanks to Missy. 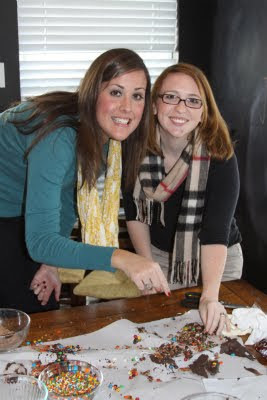 Here are Lindsee and Jen, sampling what was left behind from candy apple decorating. You can't believe how good this was. And this is why my post-birthday detox was totally wrecked and I get to start over today. I love these girls (and all the ones we were missing (including the one in Tennesee!)) so much. Lindsee, Jen, me, Missy, Ashley, Kristy and Erin. When Jackson was a baby I carted him all over the Dallas/Fort Worth Metroplex. Sometimes we did things that would be fun for him, and other times we did things that would be fun for me. We had lots of friends in the same stage of life that we could connect with. We were rarely confined to our house. When we moved back to Houston, everything changed. I'd never lived here as a mother and I didn't know all the great places to take kids. We also lived farther out of the city than when we lived in Irving (just a stone's throw from downtown Dallas) and the fun stuff wasn't as accessible. On top of that, I had morning sickness almost immediately upon our arrival to Houston. My North Texas-born baby was now an extremely active two-year-old who was big and strong and refused to hold my hand and walk nicely next to me. 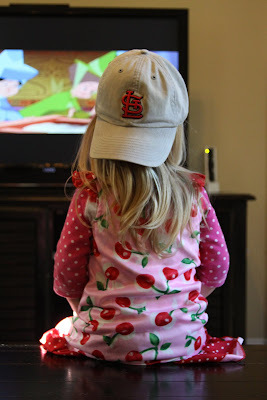 Next thing I knew, we started potty training and got in the habit of staying home all the time. Then Annabeth was born and I found it overwhelming to leave the house unless I really needed to. I started avoiding play dates, but that is a story for another day. When I realized my new MOPS group was all about play dates and I pondered telling them up front that I was never coming. Awful. Church was our social life. That's not all it was, of course, but it was largely where that need got met. I got to know another mom who became one of my best friends because we were in the nursing room together so often. 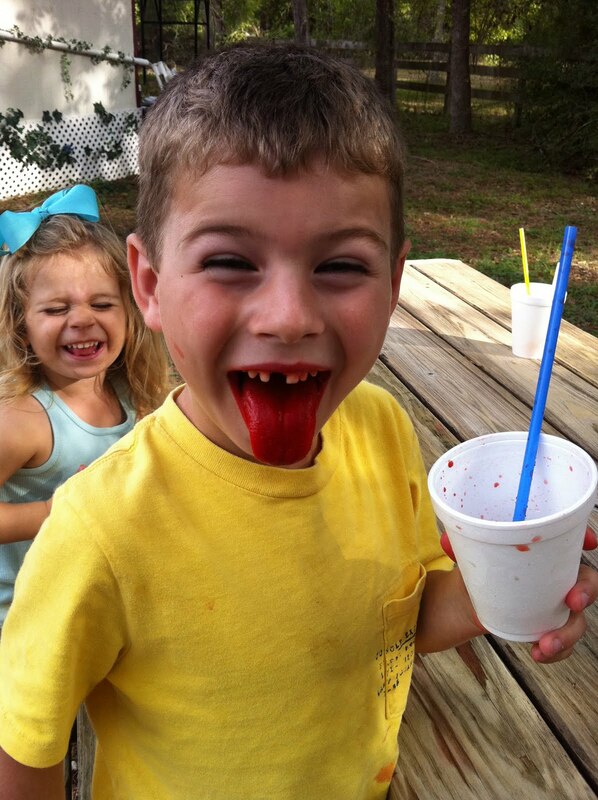 I have extremely fond memories of everything Jackson and I did when we lived in D/FW. Sometimes I read the early posts of this blog and relive it all with a smile on my face and wet eyelashes. When I do, I can't help feeling sad (and guilty) that I was never that footloose and fancy free with Annabeth. I wish I had that same energy for her. I wish doing things that should be fun didn't stress me out so much. The things I am better at as a mother the second time around probably outweigh this one aspect, but I'd still like to change it. 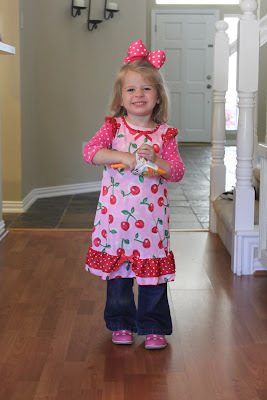 Now that I'm getting comfortable with the whole kindergarten routine, Annabeth and I are starting to get out more. 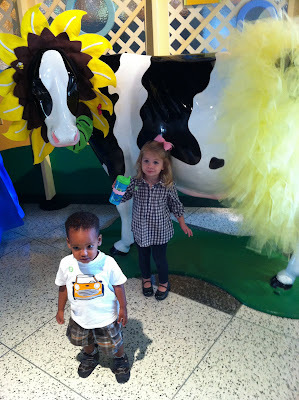 Today we met a friend and her son at the Children's Museum. Honestly, I would never have gone there if my friend hadn't invited us. But it was so simple with one kid! Seeing my friend with her first born took me back a few years. I loved how easy going and enthusiastic she was. I want to be more like that. Annabeth and I have been driving into the city to meet up with my sister for lunch once a week. I feel like the richest woman in the world because I have her and my mom close. They are definitely helping me get out more. Last week Melissa, Annabeth and I went to Barnaby's and sat on the patio, then hung out on her back porch with coffee and tea. Today she met us for tacos before we headed home from the museum. I'm enjoying my sister so, so much. After today, for the very first time, I think I might be able to do for Annabeth what I did for Jackson. Eating at the play cafe. We tried really hard to get a great pic of AB and Zane. This was as good as it got. I'm not sure a boy really wants to get close to a cow wearing a tutu and a giant flower. He is some kind of cute, though! On Friday night our little family went out for an early dinner at Russo's. They have our current favorite pizza - coal fired, New York style pepperoni. Praise the Lord. 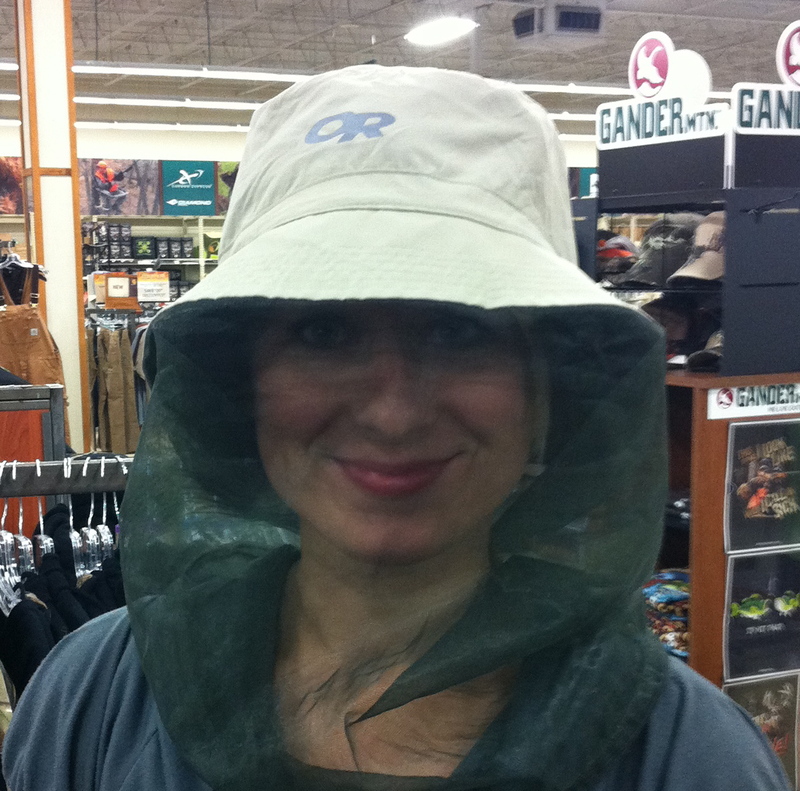 Afterward we went to a store called Gander Mountain so that I could buy some advanced form of mosquito repellent for the clothes I'm going to wear in the Amazon. I also had to buy a hat with a rim all the way around. Bonus! 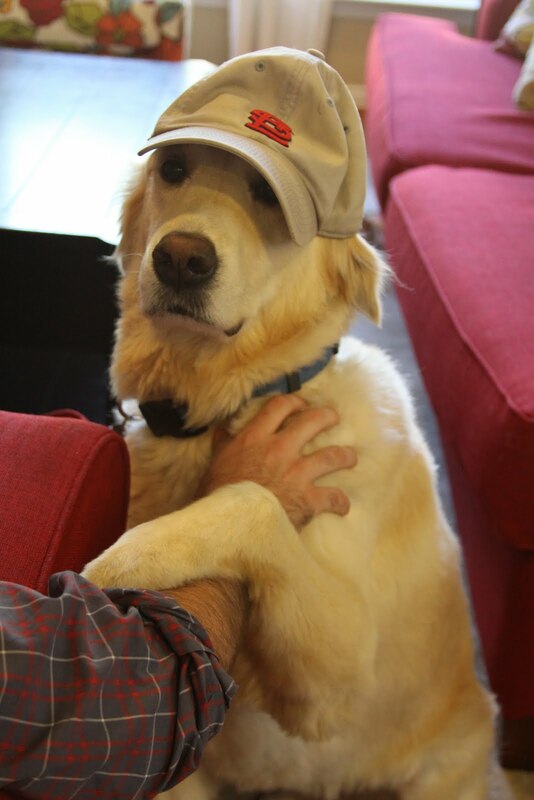 Jackson got really excited about the hats and wanted one for himself. Not wanting to buy two, I told him I would buy this hat for him but he'd have to let me borrow it for my trip and he couldn't wear it until I got back. This was the perfect compromise. Now, I am cursed with expensive taste and of course the one hat that I actually loved turned out to be $75. Um, no. So I moved on to this one. Amazing, right? If I were a bee keeper. Eventually Jackson and I settled on a hat that looks ever-so-slightly Texan, repels water and dries quickly. So yesterday morning I was getting my boy ready for school and I put on the hat just to be awesome. I told Jackson I was probably going to wear it to pick him up from school. Then we had a major milestone. "Mommy, I think that would look silly." Did my son just get scared that I would embarrass him at school? I think so! Then I mentioned it again - just teasing him, of course - and he said, "Mommy, that would be silly and a bad word." "And a bad word? Huh. What bad word would that be?" I ran into my room and locked the door behind me. I blurted all this out to Curtis and we both died laughing. Then I went back into the living room and asked Jackson to spell the word for me. "It starts with 'S'." Curtis was sweating. I, however, knew what it was going to be. I'm just glad my son will never have to see me in my sweet Amazon clothes that will be arriving from Columbia any day now. I resolve from this day forward to shelter him from all things silly and a bad word in his mother's wardrobe. Both Jen and her husband, Brandon, have been an encouragement to me this year. I haven't met them in person, but they have extended a kind word and a prayer at times when I thought I might sink down in the anxiety and complicated emotions that went along with jumping off the big ship and sailing off in our own, new boat. Jen told me that their church prayed for us on our launch day, which meant so much to me. I hope one day to get to visit Austin New Church and see their wonderful ministry with my own eyes. 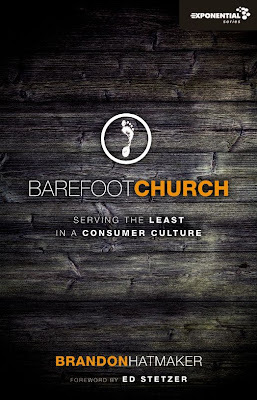 When Brandon tweeted about the new book he was writing called Barefoot Church: Serving the Least in a Consumer Culture, we were in the middle of making decisions about how Bayou City Fellowship was going to be. I responded with great (scary?) enthusiasm to read the new book. It went something like this: Please, sir, I could really use it right this second! I know your book isn't coming out for months and months but we have no time to spare! I even asked if I could be one of the reviewers for the book, which will make my fellow bloggers laugh because they know how rarely it happens that way in the blogosphere. Before I proceed, I need y'all to know how hard it is for me to read non-fiction books. They're my weakness. My husband, on the other hand, devours non-fiction books at the speed of light. And, FYI, I accidentally typed speedo of light just now. 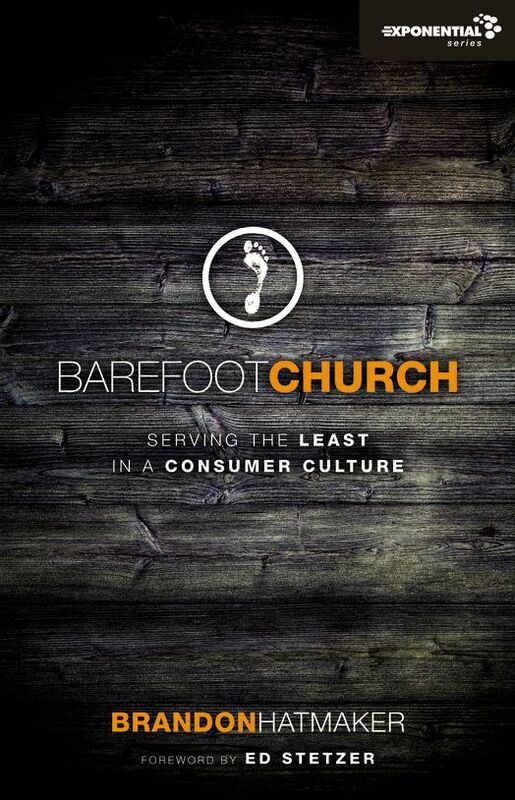 I loved Barefoot Church and highlighted approximately half of every page. It is relevant to any servant of Christ, not just those who are involved in planting churches. One thing it really helped me with was defining terms like missional, attractional, incarnational, social action, social justice, mercy ministry and justice ministry. Maybe y'all can rapidly and thoroughly define all those terms, but homegirl could not. Last winter I found myself trying to describe the vision of Bayou City Fellowship and I found it very hard to put in words. This would have helped! Amen! I shouted "Yes, Jesus!" when I read that. BCF was incredibly blessed by two other kingdom-minded churches in our city who saw it the same way. They hosted our core team meetings throughout the summer and provided childcare for our kids. I don't know what we would have done without them. Oh Lord, help us all to seek your kingdom rather than our own. I learned a ton from this book and was also thoroughly challenged and encouraged. I took away much more from it than what I can describe in a blog post. I'm really thankful for the Hatmakers' willingness to share their family's journey through church life and family life. (They just brought home two children from Ethiopia.) They're also not afraid to tell on themselves, which is really refreshing. God is certainly using their unique gifts, experiences and passions to equip and challenge the saints. Barefoot Church is available here on Kindle and here in paperback. 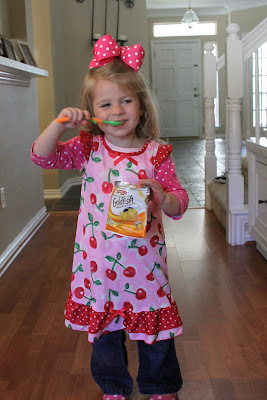 Annabeth is using a baby spoon to eat Goldfish crackers one by one out of their little bag. This is making me very hungry for a Frito pie. I hope that you have had the simple pleasure of eating a Frito pie with the chili and cheese poured right in the bag. This craving is ironic because today I officially began a post-thirty-second-birthday-detox. Or P32BD. I threw off the french fry restraint for a few months and I'm going back to the land of a side of fruit. Fun times! Actually, fruit tastes pretty fantastic if you're not eating fried potatoes all the time. I ordered Annabeth some new pajamas and they arrived today. She wanted to wear the gown she has on right away and firmly told me that she was not wearing the other two because they're "too big." 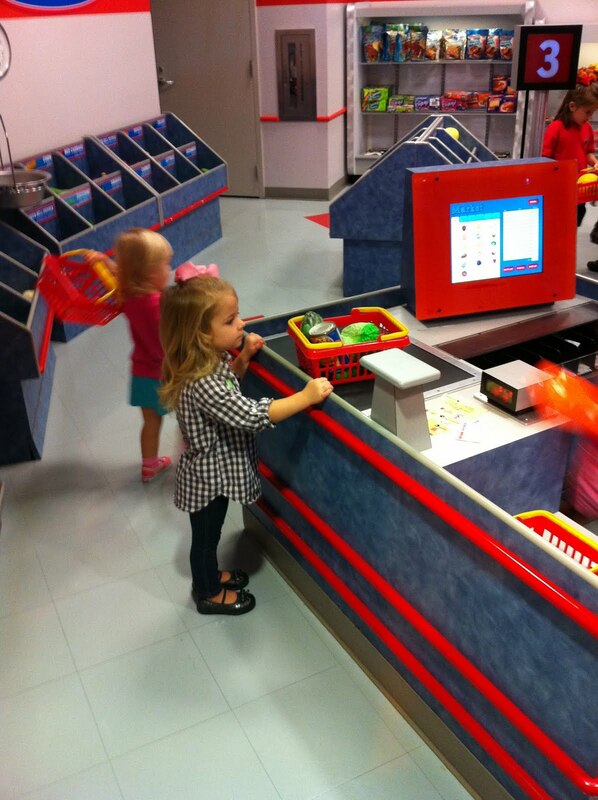 She's wearing me out with all of her fashion opinions. However, I did get her to wear the biggest bow in our possession today. It's big even for southern standards. When I was nine years old my mom took my sister and me to the newly opened Sea World in San Antonio, Texas. I vividly remember walking through the parking lot and saying to the whole group, "There are too many Mexicans here." My mother nearly snatched me bald-headed. She rebuked me to the highest degree and I feel certain she had never been more ashamed of me. A terribly sinful attitude in my heart was exposed. I'm not sure how much my heart really changed at that point, but I definitely learned not to say things like that again. Several years later, as God would have it, I landed in a 7th grade Spanish class against my will. I'd signed up for a theater class as my elective, but something went very wrong. I had no plans of ever taking Spanish - French sounded so much prettier, I thought. I really don't know why I didn't march into the counselor's office and have my class switched. It probably would've been easy. Nevertheless, I stayed in the class and was absolutely terrified to be called on. I was embarrassed for anyone to hear me try to speak with an accent. Although when my teacher heard me speak, he asked if my family spoke Spanish at home. No, actually we spoke a blend of Houstonian (where you drop the H-sound from the beginning of words) and Arkansan (using weird figures of speech, such as snatching one bald-headed). It took me many years to understand what my teacher meant when he asked me that question. hay demasiado?" Amanda, are there too many? Can you see how God did not, would not let this go? It was a full circle moment. I had sin and ugliness in my heart toward Latin Americans, but God had mercy on my soul and did not leave me that way. He stuck me in a Spanish class I never wanted to take, gave me a knack for a language I never wanted to speak, and made me love it. In doing so, He gave me a deep and sincere love for a culture and a people that I used to dishonor in my heart. You may be thinking "This girl is crazy. I can't believe she told that." We're not really supposed to talk about this, are we? You may be wondering if I'm embarrassed right now. Well, yeah, I am. But God has gone out of His way to redeem my sinful soul. He made beauty out of the ashes that had smoldered privately in my heart. I praise Him for plucking a thorny, ugly, poisonous bush out of my soul and planting something fruitful and life-giving. One of the most cherished treasures God has ever given me is the gift of Spanish. When I hear and understand it, I feel God's pleasure. When I get up the nerve to speak it even though I have been out of classes for almost 10 years, I feel God's pleasure. I see His glory because something happened in my heart that could only have been done by Him. I would be embarrassed to speak Spanish in front of any of my former teachers now. I've lost so much already. But what remains, even as the meaning of pluscuamperfecto now escapes me, is love. I can no longer understand everything someone says to me in Spanish. I'm of no use as a translator. But what I can still do - and love to do - is give honor. In my high school Spanish classes we used to watch an educational telenovela called Destinos. Maybe some of you know what I'm talking about. I was thinking about the word destino recently - it means destiny or destination. That seems like such a fitting theme for this story. It may have been my destiny as a young, white, privileged American to grow up truly believing I was superior to people of another economic standing or race. But God changed my destiny. He also gave me new destinations. I have been incredibly blessed to visit places like Venezuela, Honduras, Mexico and Guatemala. Last fall I had the privilege of traveling to Guatemala on a Compassion blogger trip with Ann, Lindsey, and Lisa-Jo. One night I was sitting in the conference room with the other bloggers while we typed out the stories of what we had seen. I told our leader, Shaun, about the journey God had taken me on since childhood. It started off with "I can never write about this, but..." I think he was a little shocked, but I wanted him to know what it meant to me to be there. It meant redemption. Jesus also brought redemption into the lives of a number of Guatemalan families because of the incredible blog readers who followed along on that trip and sponsored children. 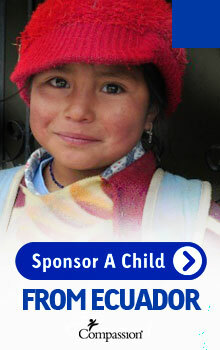 I heard from someone just last week who had been thinking about sponsoring since that trip and had finally done it. That's so awesome. I'm still pinching myself over this news, but I'm really excited to tell you that I have a new destino with Compassion. I'm going on a blogger alumni trip to Ecuador next month. What grace! We're going to be in the city of Quito for part of the time, and then we're getting in boats and going into the Amazon. Whoa, Nelly! I can only imagine what kind of shenanigans Ann, Sophie, Melanie, and Kelly and I are going to have in those canoes. We will be blogging from November 8-12. I hope you will follow along. Once upon a time, I was a little kid who lived for Saturdays. I woke up super early to spend the whole morning watching cartoons in my jammies. Mom made us pigs in a blanket or cinnamon toast while Dad watched Pee Wee's Playhouse with us in the living room. I seem to remember that we all said Saturday more like Saturdee. Or Saturd'y. Then one day I became a teenager who lived in a constant state of physical, emotional and hormonal exhaustion. I lived for Saturdays because I could sleep in. In those days, a successful morning meant not getting out of bed until 11 AM. At the earliest. Fun for me would mean going to the mall with mom and hanging out with my friends at night. Ten years later I had married a great guy and had a smiley, beautiful baby boy attached to my hip. We lived in a big city four hours away from home. Saturdays could be kind of hard. Our family of three enjoyed being together, but if we had a lull in our schedule I sometimes thought, "What are we doing here? Everyone is spending time with their families and ours aren't here." I didn't feel that way all the time, but on Saturdays there was an ache. A few years and another baby later, we are back Houston where I used to spend so many Saturdays sleeping the day away. Now I live for Saturdays because (A) my husband is home and (B) so is this guy. Most Saturday mornings I make cinnamon rolls out of a can. I bargain with my kids/beg for mercy to get them to sleep late. They didn't wake me up until 7:30 this morning, which I considered a success! They watched Yo Gabba Gabba and Snow White in their jammies. We skipped taking baths and headed out to the country to play under trees and stomp around in dirt. We enjoyed the company of my parents, grandparents, an aunt, two cousins and three happy dogs. When we all had enough grime on our faces and under our nails, we took off in search of a snow cone stand. Then we got cleaned up, ate leftovers, and put the kids down early. This is the kind of Saturday I live for now. Finally, be strong in the Lord and in his mighty power. 11 Put on the full armor of God so that you can take your stand against the devil’s schemes. 12 For our struggle is not against flesh and blood, but against the rulers, against the authorities, against the powers of this dark world and against the spiritual forces of evil in the heavenly realms. 13 Therefore put on the full armor of God, so that when the day of evil comes, you may be able to stand your ground, and after you have done everything, to stand. 14 Stand firm then, with the belt of truth buckled around your waist, with the breastplate of righteousness in place, 15 and with your feet fitted with the readiness that comes from the gospel of peace. 16 In addition to all this, take up the shield of faith, with which you can extinguish all the flaming arrows of the evil one. 17 Take the helmet of salvation and the sword of the Spirit, which is the word of God. 18 And pray in the Spirit on all occasions with all kinds of prayers and requests. With this in mind, be alert and always keep on praying for all the saints. The first memory I have of dealing with spiritual warfare was when I was a young teenager. My mom was writing her first Bible studies and our family came under the enemy's attack from every direction. When I take time to think through it all, it seems like something out of a movie - or at least a TV drama. The enemy desperately wanted to - and still wants to - prevent my mom's life from bearing much fruit. He tried all he could to stop her from writing Bible studies that would help women all over the world to know God through His Word. In the months before Curtis, Jackson and I left Irving, TX (winter of 2008), I entered a season of spiritual warfare that I had never experienced before. I began struggling with tremendous anxiety and destructive dreams every single night. I didn't realize what was going on. I just thought I must have some issues that I needed counseling for, so I made an appointment to see a Christian counselor. The night before my first appointment, I dreamed that a dark spirit flew into my room and touched me on the chest. The next morning I woke up and my chest hurt really bad, but I did not remember the dream. Later, I sat in the counselor's office and described why I had come. She asked if it could be warfare. Suddenly I remembered the dream and it all came together. Over time that attack eased, but it started up again this year. I've had consistent anxiety and my dreams have become a battlefield. My husband began suffering attacks in his sleep, too. Curtis is the least fearful person I know, yet he began to fear falling asleep. He was not only afraid of nightmares, but of waking up blind and deaf. I'm thankful for that very specific and bizarre fear because it helped us to see that what we were experiencing was a spiritual battle. We've asked many friends to pray for us and I know they have. I have never felt the heat of the battle more than I have in the last month. Night after night the enemy attacked me in my sleep. I spent my quiet time two Sundays ago broken and weeping on the living room rug. I thank God that I knew exactly which friends I could text in that moment and ask for prayer. They were well aware of my junk, my vulnerabilities, and the way the enemy tends to mess with me. They immediately lifted me up and bore my burdens. I was able to get up from the ash heap get on with our Sunday. The attacks didn't stop on that day. Curtis began fighting with me in prayer. A friend many states away knew in her spirit that something was up and began praying. I stopped being so shy about who I asked to pray for me because I was totally desperate for this to end. I did not know how I could carry on under the weight of it. A couple of times, while telling a friend what I was going through, I heard a voice whisper, You can't tell that. You're a pastor's wife. For a minute I believed that ugly voice but it took a half a second to figure out whose it was. I believe the enemy wanted to keep me from telling on him. His attack was weakened when it was exposed and when the saints prayed. This Sunday morning I woke up and sensed in my spirit that God had given me victory over my enemy. That specific battle was over. My Savior had said Enough! and the accuser was silenced. The heaviness was gone. I praise God for giving me the grace not to drown in the tidal wave. Jesus was faithful to remind me that I was justified before Him. No matter what the enemy wanted me to believe about myself, His blood covers me. His Spirit dwells in my core. I'm so grateful to my amazing friends who held me up when my feet were slipping. They listened to me and believed me. Last winter I took some girlfriends to a conference called Intimate Issues with Linda Dillow and Lorraine Pintus. One thing I learned - and will never forget - was an illustration of temptation. Picture that you are walking down a long hall toward a specific temptation. At first the hallways on both sides are big sliding-glass doors. You could get out very easily. But as you go along they become regular windows. They open, but not as easily as doors. You could still get out, but it would take a little more effort. Down a little farther the windows start getting smaller. The next ones are narrow and more far apart. Getting out of this hallway wouldn't be so easy now. Finally, you realize you are getting very, very close to destruction, but now your way of escape is beyond your reach. The window is so high and so small that someone is going to have to hoist you up and maybe even give you a shove to get you out. At that point, will you ask for help or will you take the last steps toward destruction? Is that not a chilling thing to imagine? Ladies, we must ask for help. Whether we're being tempted and we're walking closer and closer to destruction, or whether we're suffering under the enemy's attack and we don't know how much more we can take, we need to ask for help. I'm not saying it will bring an immediate end to the trials we're going through, but there is protection in letting those close to us know what's going on. This has been a very humbling time for me, no doubt. But the spoils of war that I'm holding onto today are increased faith - which is of greater worth than gold, the readiness to pray for those who are enduring the same trials, and love for my mighty and merciful Savior. These are some of the verses Curtis preached on last Sunday, which is the day God told me He had given me victory over my enemy. Surely this was no coincidence. Praise be to the God and Father of our Lord Jesus Christ! In his great mercy he has given us new birth into a living hope through the resurrection of Jesus Christ from the dead, 4 and into an inheritance that can never perish, spoil or fade—kept in heaven for you, 5 who through faith are shielded by God’s power until the coming of the salvation that is ready to be revealed in the last time. 6 In this you greatly rejoice, though now for a little while you may have had to suffer grief in all kinds of trials. 7 These have come so that your faith—of greater worth than gold, which perishes even though refined by fire—may be proved genuine and may result in praise, glory and honor when Jesus Christ is revealed. 8 Though you have not seen him, you love him; and even though you do not see him now, you believe in him and are filled with an inexpressible and glorious joy, 9 for you are receiving the goal of your faith, the salvation of your souls.